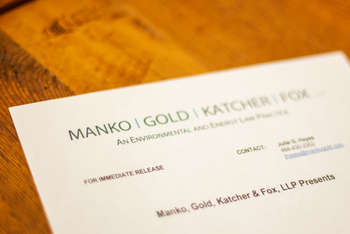 Manko, Gold, Katcher & Fox partner John F. Gullace will be discussing CERCLA liability (Comprehensive Environmental Response, Compensation and Liability Act) as a panelist on a March 5 webinar entitled, “Allocating CERCLA Liability: Divisibility or Section 113 Equitable Contribution”. Gullace and the panel will examine the statutory language and what the Burlington Northern & Santa Fe Railway Co. v. U.S. decision means for divisibility, provide guidance for environmental counsel on when the divisibility of harm defense is appropriate and discuss tactics to overcome challenges in proving divisibility. For full course details and registration information, go to http://straffordpub.com.